Great room and kitchen floor is source of debate. I can get Ash flooring, random widths, from local saw mill for $3.50 sf. Not sure about install/finish cost yet. LOML(WMBO) is looking at "Engineered" flooring at about same price. I am concerned that she will get tired of the artificial stuff in a few years and we will be replacing it. She is convinced that there will be maintenance issues with hardwood. So I am wondering who has some experience with hardwood flooring. If we use a heat pump and keep house at about the same temp all year how much does the wood shrink/expand over time? If we have it sanded/finished with urethane after installation are the joints sealed or are spills, etc a problem? It's our "geezer" house so wear from children, etc shouldn't be an issue but what should we expect in maintenance? Any other problems we should anticipate? About 18-20 years ago I installed this prefinished Oak flooring I bought from Lowes in my addition and great room and haven't had any issues with gaps due to changes in humidity. I laid down 15lb tar paper as an underlayment. Make sure the sub floor is secure to prevent possible squeaks. The finish is VERY durable and I haven't noticed any wear on the high traffic areas. Obviously keep moisture away from it. I had a leak at one of my doors and the wood moved but I have a throw rug over it so I don't see it after fixing the door. The only thing I don't like about it is there is a bevel on the long side of each plank and it traps dust and small particles of dirt but rather than using a broom I use a vacuum cleaner to clean the floors...works well. It's real wood flooring...not the floating stuff. - Click-lock MDF-core laminate. OK for use in basement catch-all room. Wouldn't use it anywhere else. Durable, but loud and "fake sounding" when you walk across it. - Engineered hardwood. We got the stuff with beveled edge, and thick enough veneer layer that it could be refinished if necessary. Looked OK because of the beveled edge. Very susceptible to damage from water, unless you're there to wipe it up right away. In our case, a seal on a patio door failed one night and let rain water seep in and pool on the floor. It buckled and the veneer layer began to delaminate after a few hours; of course, this happened two days before closing as we were getting ready to sell and move to our current home. In our current house, engineered hardwood was in place when we moved in. All sorts of damage/staining in kitchen. We replaced it at first opportunity. - Resilient vinyl tile. Used in our current kitchen to replace the engineered hardwood that was in place when we moved in. Love it. Feels good underfoot, not cold in winter, and very durable. Easy to clean. Easy to replace a tile if we really damage one (this hasn't happened in the nearly four years since installation). - Vinyl plank in bathrooms and downstairs in basement on slab. Durable, looks OK, easy DIY project. If you go this route, make sure it has a beveled edge. A good choice for us. - Traditional hardwood in family room/dining room/main hallway. Style/species is hewn/scraped hickory. Really like it in our rural country-style home. Factory finish is the way to go, IMHO. Can't beat the durability of the aluminum oxide factory finish. I like a more rustic look to the floor, and we get lots of nice comments when people see it. We had it installed by a pro; glad we did. We had a water incident with a washing machine malfunction nearby. It cause the floor nearest the machine to buckle. However, I repaired it myself after I got it dried out. If there's a downside, sometime it will squeak in certain spots, but not badly. To recap: if it was me, I'd skip wood floors in the kitchen and go resilient vinyl tile. Absolutely would NOT get engineered hardwood for use in the kitchen. For living areas with low risk of water damage, I'd go traditional hardwood. I think most folks can easily tell the difference between engineered hardwood and the real stuff. We have old wood floors. Ours are 70 years old. They just get better looking as some say. What will engineered floors look like in just 20 years? You'll have the same maintenance issues with engineered as you would with hardwood but you won't have to stain and finish the engineered stuff. A big downside (imho) with engineered is refinishing. If you're lucky, you'll only be able to sand and refinish the veneer once. But, the veneered stuff may very well have a more durable finish than you can put on the hardwood yourself. I've done the Parks water-based finish on our stairs over oak. 7 brushed coats and it's not wearing as well as expected. If I were to do it again, I'd look for something else and spray it on. Maybe a catalyzed finish. Hard to spray finish an entire floor though, probably deadly. I installed pre-finished oak (Bruce) in the last house in every room and even with two large dogs it looked pretty decent after 11 years and I expect to put it down in our current house. Current house (20 years old) has the real stuff in the kitchen, it's been refinished at least once (sanding drum marks if you look closely) and is actually in very good shape. No bevel edges, and the joints are very tight. Last house had the pre-finished in the kitchen/mud room area (no idea of the age) and in the 5 years we lived there it looked extremely good as well. This floor did have the beveled edges, and I wasn't crazy about them. I should add, the dufus who had the last house used used some type of silicone floor wax on the floor, and when we put the house up for sale, the wax looked so bad I spent 2 days on my hands and knees stripping it off with ammonia...really made the wood look nice again. If "engineered" floors are a veneered product, I have no experience with them....but I'm pretty sure I wouldn't want them as a floor. 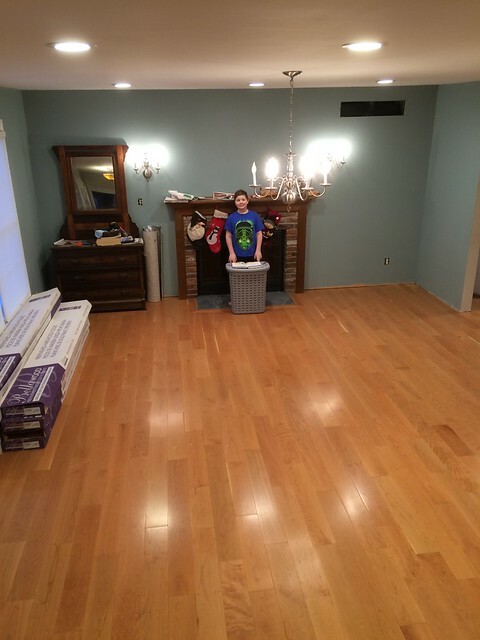 (02-07-2019, 08:47 PM)Duane N Wrote: About 18-20 years ago I installed this prefinished Oak flooring I bought from Lowes in my addition and great room and haven't had any issues with gaps due to changes in humidity. I laid down 15lb tar paper as an underlayment. Make sure the sub floor is secure to prevent possible squeaks. I have this same flooring in Natural Oak. It's excellent..........easy to install, very little waste, durable, solid oak. It's a steal. Now 10 years old. Hard maple, finished w/3 coats Minwax Poly for floors. Full basement under the house. Have whole house fan, have windows open spring/fall for weeks at a time. The joint shown is the only one for the wood flooring as the flooring is monolithic on the right---living room, hall, three bedrooms. Meaning no transitions at doorways. Installed over 15# roofing paper and stapled, spacing staples about every 12". No shrinking/expansion. No buckling/warping. No gaps/openings between planks. Used a gloss poly, which has dulled---three dogs and three/four people. The only problem is sun bleaching except under area rug. Move a rug and there is color differences. I've put in about 1,500 sft of prefinished hardwood in my house over the last 5-ish years. It's all been Bellawood from Lumber Liquidators. In the kitchen, it replaced an engineered laminate, the fake wood but higher end stuff (anderson?- it was there when we moved in). TBH, the laminate in the kitchen stood up to drops and spills better than the hardwood (mine is cherry). The other rooms are bedrooms and I used white oak. I agree with the other poster about the bevels on the pre-finished hardwood. I don't remember the cost for prefinished being too much higher than what you are looking at. To me, the time saved not having to sand and finish makes the pre-finished a no-brainer. As far as wear and tear, we are about as hard on a floor as you can be so we have a ton of dings, scratches, etc. in our floors- especially in the kitchen. It bothers me a little, but I just chalk it up to character. I'm a WW so I like the look and feel of wood, so I wouldn't even consider laminate even though the good stuff holds up pretty well. Engineered wood is real wood over a substrate. It has a factory applied finish. It is good for one or two refinishes. Pre-finished solid hardwood floors are solid wood and also have a factory applied finish. The finish on either should last about the same. Pre-finished solid wood often has a bevel on the edges to make the joints look tighter. You can see the bevel in this image. When it comes time to refinish you need to sand below that bevel; a lot of sanding. Probably because they can control the straightness of engineered flooring (and because the wood surface is quite thin) they do not usually have that bevel in engineered flooring. Engineered flooring can be refinished one or possibly two times. Unfinished hardwood can be straightened on site and so no bevel is required. It can be refinished more easily than the beveled flooring and, in my opinion, if it is cost-competitive with prefinshed and a good finish is applied, it is a better deal.